Environmental watering improves the health of rivers and wetlands to benefit the plants and animals that depend on them. It delivers water to mimic some of the flows in rivers and the wetting and drying patterns in wetlands that would have happened naturally. A river will not thrive without a combination of different environmental flows, because each type of flow achieves different purposes at different times. Flow variability is one of the keys to healthy rivers. 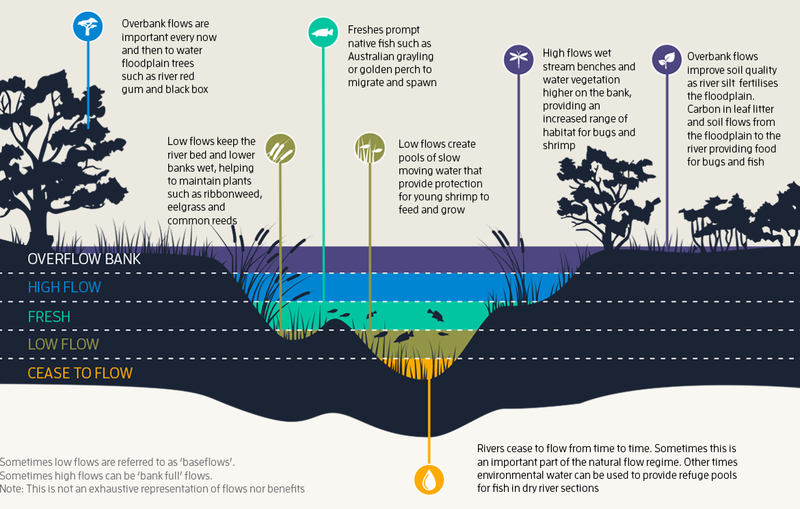 The illustration here demonstrates why: In short, different flow types – flowing at different heights and speeds – provide diverse benefits for plants and animals in a waterway. Rivers need a variety of different water heights, or flows, throughout the year. Water for the environment managers generally can't deliver all of the flows that would have occurred naturally, at the right time of year, because there are limits to what is possible in modified river systems when water also needs to go down rivers for households and farms. Water delivery posing a flooding risk to private property. Water for the environment managers aim to achieve the best environmental outcomes possible within these limits. Water for the environment will only be delivered on private land with permission from land owners. In rivers, water for the environment is often delivered to mimic some of the flows that would have happened naturally, before dams, weirs and channels. This is vital for the physical, chemical and biological health of rivers. Water for the environment managers generally focus on returning some of the small and medium-sized river flows that are critical in the life cycles of native plants and animals. These flows can move sediment and nutrients through rivers, connect habitats and improve water quality. Releasing the right amount of water into rivers and wetlands at the right time of year, for the right length of time, supports native plants and animals. For example, fish such as the threatened Australian grayling rely on an increase in river flow in autumn to signal them to migrate downstream to breed. Many wetlands are now disconnected from rivers that used to naturally fill them or are permanently connected to rivers or channels. This means that some wetlands don't get enough water, and others get too much. Water for the environment managers focus on mimicking more natural wetland wet and dry cycles that plants and animals have evolved to depend on. For example, where wetlands and floodplains have been cut off from rivers, water for the environment can be used to reconnect them via irrigation infrastructure such as pumps, channels and regulators (devices that control water flow). Water for the environment doesn't try to return rivers and wetlands to their pre-European condition. Rivers and wetlands require more than water to be healthy. The type and amount of plants, climate, pest plants and animals, land use and activities by landholders, also influence river and wetland health. It's also crucial to do works that protect them. Fencing and revegetation, erosion and pest control, returning logs to rivers for fish and bug habitat, and installing fishways to allow fish to pass through dams and weirs are all important activities that complement environmental watering. Naturally, some wetlands are always wet, some are mostly wet with some dry phases, and some are mostly dry with wet phases. 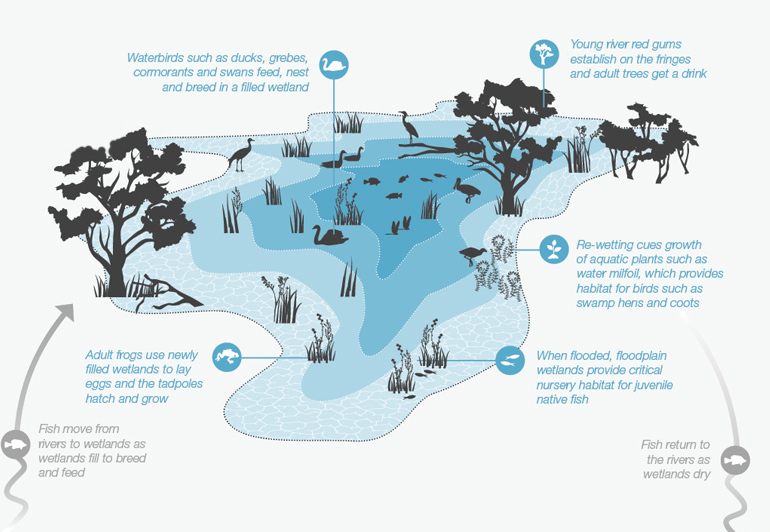 The frequency, extent and duration of the wet or dry phases varies from wetland to wetland, depending on where they are on the floodplain. The construction of dams, weirs, and channels has resulted in many wetlands either being disconnected from rivers or permanently connected to rivers or channels. This means that some wetlands do not get as much water as they used to, and others get too much. Where possible, water for the environment managers mimic the wetting and drying phases that happened naturally. 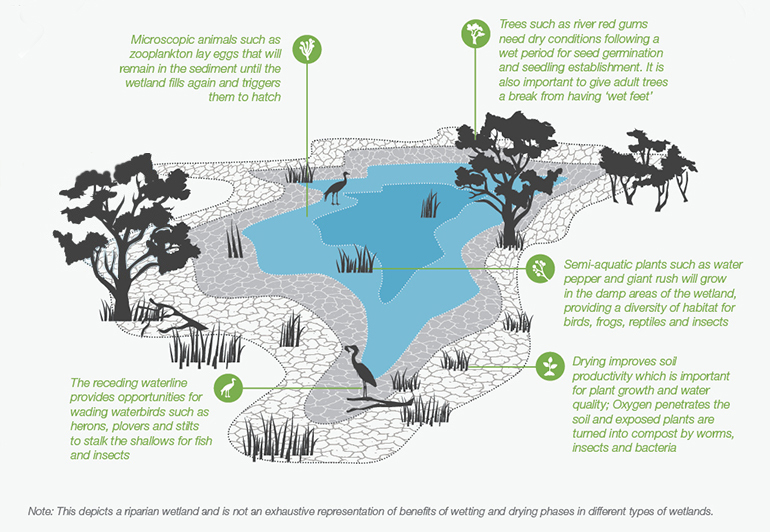 Many wetlands will not thrive without wetting and drying phases, because each phase achieves different purposes at different times. This variability is one of the keys to healthy wetlands. Like rivers, the aim of environmental watering is to protect plants and animals and generally improve the health of modified wetlands.